Do artists see nature differently than other people? Do artists seek to replicate nature, enhance it or just see something others don’t? Paintings more often than not have a life that is different from what one might see with the naked eye. When artists choose nature as subject, nature changes, becomes something more. Whether landscape, still life or botanical illustration, nature through the eyes of the artist shimmers with a vivid electrical quality that might have previously escaped notice. The website, Skinny Artists has “150 wonderful art quotes that can inspire.” Among the quotes is one from Russian born artist, Marc Chagall. Chagall states, “Great art picks up where nature ends.” Chagall’s message is the goal nature artists are working for. These artists are enhancing nature and bringing it to life in a way not usually seen by the average eye. Nature artists seek to give notice to simple beauty that might otherwise be missed. Botanical illustration is frequently categorized as more science than art. Yet what botanical artists are depicting is more than simple scientific re-creation. Their illustrations give nature the intrigue that leads us to look more closely. 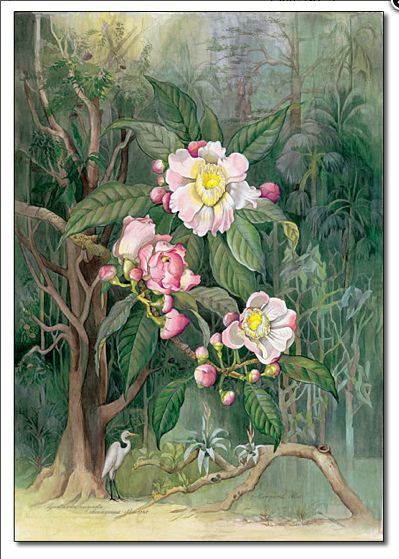 Margaret Mee, (1909-1988), conservationist and botanical artist, brought the Amazon Rainforest to life through her paintings of orchids and other exotic plant life she encountered on her excursions into the untouched rainforests. The vibrancy of nature in Mee’s art sparked an interest in the rainforests that led to later efforts to protect and preserve this vast eco-system. Today the beauty of nature through botanical art is fostered and nurtured by the American Society of Botanical Artists, (ASBA) and The Society of Botanical Artists, (SBA) in the United Kingdom and other national, international and regional organizations. These organizations continually show us how wonderful the world of nature is when viewed through the magic of the artist’s hand. Botanical artists are the portraitists of plant life, highlighting the beauty and uniqueness of individual horticultural species. Botanical artists “pick up where nature ends” to open our eyes to the beauty around us. Nature is never ending while art lives. The following Margaret Mee painting and others can be seen at the Audubon House Gallery of Natural Art. This entry was posted in Uncategorized and tagged American Society of Botanical Artists, Audubon Gallery of Natural History Art, Botanical Art, Color, Marc Chagall, Margaret Mee, Nature Art, Skinny Artists, Society of Botanical Artists, Visual Arts. Bookmark the permalink.